In socialist Venezuela, Nicolás Maduro has instituted military courts and uses gangs to round up protesters for speaking out against the government. The father of one of the country's most celebrated activists, Leopoldo López, explains how bad it's really gotten. To keep you is no benefit, to lose you is no loss. 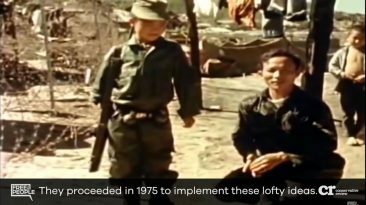 This was the philosophy of the brutal Khmer Rouge regime, where socialism killed one in four Cambodians. Castro's death gives us the opportunity to learn about the failures of socialism, but don't expect to hear the truth from world leaders who praise the dictator who killed 141,000 people. Kim Jong Un has come up with the craziest variation on socialism ever: treat it like a hereditary monarchy. Zimbabwean President Robert Mugabe describes himself as "the Hitler of the time" as his people are oppressed and starved. Venezuela's socialist government is grabbing people's guns, the same step the preceded genocide in other socialist regimes. Chairman Mao's Great Leap forward was a socialist plan to turn farmers into steelworkers. In the end, neither food nor steel got produced, while millions starved. In the continuing power struggle that is Venezuelan socialism, the country has closed its borders to stop people getting food from other countries. Things in Caracas, Venezuela have gotten so bad that it's almost unbelievable. Socialism kills, but you don't need to go back in history to understand the meaningful and devastating impact this toxic ideology has. Just look at Venezuela today. Nicolás Maduro has squashed efforts to recall him, proving once again that centralized power is at the root of socialism. How Many People Has Socialism Killed? Vladimir Lenin, Joseph Stalin, Mao Zedong, Kim Jong-un, Kim Jong-il = 100 MILLION people killed by socialism. Socialism is all over the news, but, as Matt Kibbe explains, the line between being a Democrat and being a socialist can get a little blurry.